Dirk and Petra Wunderlich’s children were returned to them after a court hearing today, three weeks to the day after their four children were seized during a police raid. The Wunderlich children were returned after the parents promised they would send their children back to a state school. “It’s a small victory, but it’s still a victory,” said Home School Legal Defense Association Chairman Michael Farris. “When the parents told the authorities that they would send their kids back to school during the raid, they were told it was too late. 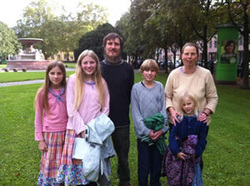 The Wunderlich children were taken from their parents on August 29 because the family continued to homeschool their children despite the German government’s open persecution of homeschoolers. In court documents received and translated by HSLDA, the seizure was ordered only because the children were homeschooled despite no evidence of child abuse or neglect. The German high court is on record for ordering suppression of “parallel societies,” mentioning homeschoolers specifically. After the Wunderlich story broke, thousands of Americans took to the phones and internet to contact the German Embassy and condemn the actions of the authorities. Farris believes that the only way to change Germany’s attitude is by embarrassing the authorities, and HSLDA is continually taking steps to increase pressure on the German government for violating human rights.